I mentioned yesterday that we have two days of department meetings. Well, the good thing is they're taking all 100 of us to a Cardinals game tonight, and because of that, they gave us the green light to wear shorts to work - woohoo! I figured I would just change out of my portofino and throw on a Cardinals shirt on our way to the game. How great is this top, by the way? One of the many, many things Gina forced me to buy. And by forced I mean that she mentioned it on her blog once. I know, so pushy, right? ;-) The shorts, I've actually had for a couple years now almost. I lusted for them after seeing them on Jenny over at Crazy Style Love here. I was so elated when I came across one of the last pairs at my Old Navy. Love when shopping fate works out in my favor! And can we talk about my hair? If you missed my shopping post over the weekend, I bought this curling wand. It's changed my life. Seriously. It does take me about 10-15 minutes (not including dry time) to do my hair vs. 5 minutes on a normal day, but honestly, it's worth it. I am in love with the curls and now I wish my hair was about 3" longer so I could have even more curls! I love everything about this! I never would have put these prints togetherbut they look perfect. I have a pair of black and white polka dot shorts listed on Poshmark, but I think I need to take them down and style them like you. At least I already have the pieces and don't have to go out and buy something, right? 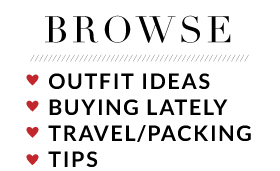 Well, if you're able to shop your own Poshmark, that's pretty awesome! Happy to provide inspiration!! Super cute! Those shorts will look great with a Cardinals tee too. Have fun! Thanks so much!! Sadly I switched to white skinnies for the game because the weather turned cold! Still a fun outfit tho regardless! Absolutely love this look! Great pattern mixing! I also love your hair! I bought a curling wand a couple months ago after nothing else would curl my hair and it worked like magic! The wand is seriously amazing! I can't get enough of it - so obsessed!! Love the mixture of patterns and those sandals! I LOVE those polka dot shorts! So fun! Thank you! I love them so much! Happy to have found them! LOL at "forcing" you by mentioning something once. That's okay, you've forced me to buy plenty. I do believe I did an entire guest post about it! ;-) ha ha. 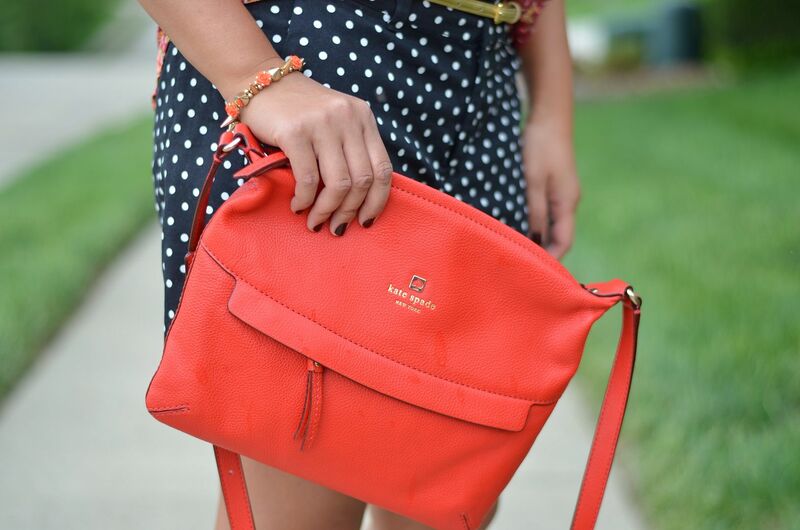 I do love that portofino on you and it's so great with those polka dot shorts. And HELLO Jamaica tan! And yes, your hair is amazing. Well worth the 15 minutes!! I wish my tan would stick around longer!! I can already see it fading and I normally hold it well! Booo!!! Yay! Have fun! Being rewarded by having a "shorts" day is always fun. It was a great time! Ended up going to extra innings which I watched from the comfort of my own home because the game went until midnight! Still so fun tho! Thanks! Thank you! It's a great addition to my porotfino collection! Love this mix of florals and dots! So cute! Thanks! I was really pleased with the results! Well, it looks like someone is going to force me to buy a new curling wand (assuming I can find it in Canada). 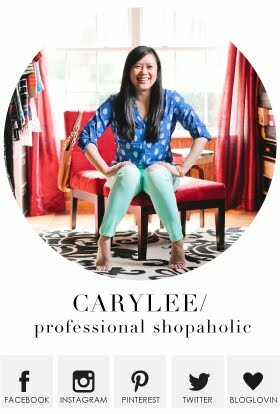 Carylee, you're so good at mixing patterns! Love looking at your patterned outfits for inspiration. That means so much - thank you! And yes, I promise you need a wand! It's so perfect, and a lot easier to use than I thought! You can do it! I normally go for a small print and a large print but even though the scale of these prints is similar, I still loved the way they paired! Thanks, I'm loving them too! OMG dying for these polka dot shorts! Way to rock them girl!! Aww - thanks! They're so much fun! Love this combo!! So cute!! I really like your blog - I'm a new follower! Aww- thanks for the support! I appreciate you popping by! 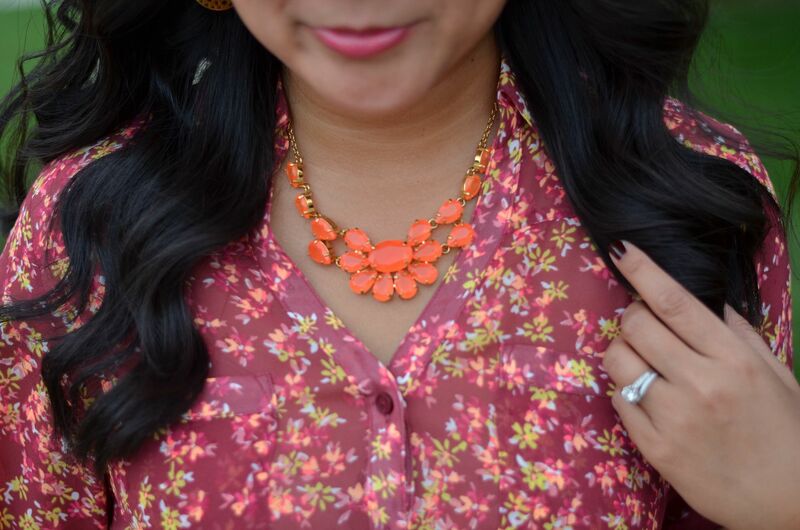 Love this floral and dot combo! Super cute outfit! You really paired these patterns beautifully! Everything about this look is just too perfect. Such a sweet comment - thank you for this! I love mixing prints and colors! Thank you! They're really fun! I wasn't sure I'd like it, but I'm very happy with how it came out! Thank you for stopping by! Your hair looks gorgeous! That curl wand was a great purchase. I have never tried polka dots and florals in the same outfit, but boy you are rocking it. Aww - well thanks for this! I hope it encourages you to try something new! You may like it! So, in today's post I am wearing some gorgeous Gucci Sunnies and totally thought of you since you and husband both love nice, expensive glasses and yes there is a difference. Come check it out. Ohh and yesterday I also wore shorts with a button-down. I liked the overall appeal. Come see!! =) Thanks. Oooh! Gucci sunnies! I will check them out! Trying to catch up from last week and all day and all night meetings! Happy to dive back into blogging again! Thanks so much! This was the first time I got to wear the sandals! They're super comfy! Really love this combo. SO cute! Thank you, Nora! I'm a sucker for pattern mixing! Carylee, I LOVE this look! Great mixing of patterns and great accessories. Loving those sandals too. Love this look! The colors are perfect for your skin tone! All kinds of fabulous - from hair to sunnies to top and shorts to sandals and handbag, seriously, ticking every box for me! Aww - blushing over here, girl, thanks!